"This election, as far as the number of scandals, is outrageous," Risinger said. "It took me two blackboards to write down the scandals, and I never even got to the Donald Trump side of it." Other teachers across Texas have faced similar queasy moments as they attempt to engage with this campaign season's inappropriate content in the classroom. 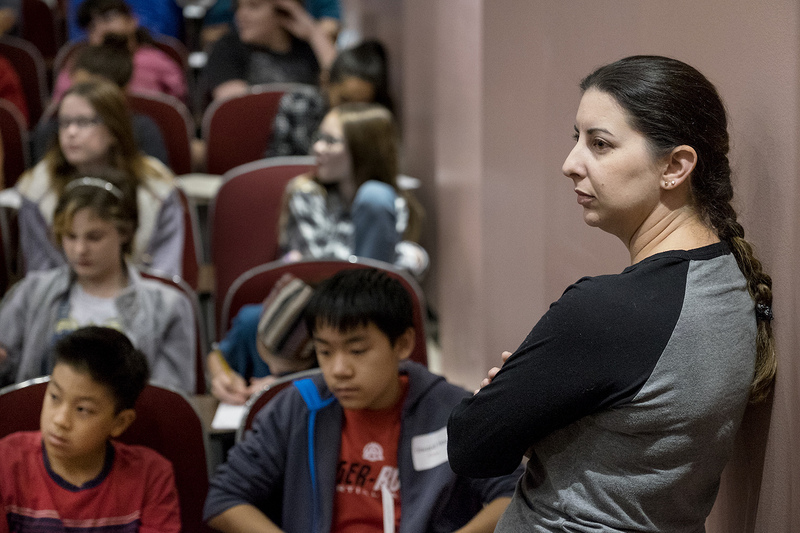 And because students can use social media to tap into that content more easily than ever on their own, teachers find themselves fielding tricky election-related questions and concerns. Grosenbacher has also used the election's divisive nature as a teaching tool. When she showed her students clips of the presidential debates, many were shocked by what they saw as a lack of substantive content and preponderance of bickering. St. Joseph High School senior Brooke Reaves, in Victoria, was happy that her government teacher addressed Trump's comments about women head on, telling male students that what Trump referred to as "locker room talk" was unacceptable. "That's one of my favorite parts about what he said," said Reaves, who is a Libertarian. "Maybe about the whole election in general." This year’s electoral politics are changing more quickly than elections past, Colby said. When former President George H.W. Bush ran for office in 1988, his campaign would take one or two days to issue public responses, Colby recalled. Today's candidates issue key public statements using Twitter and other fast-paced social media sites. “The turnaround time on how fast you get a full-blown social media blitz is remarkable. It won’t take a full day,” he said. But she also added that Clinton didn't loom behind Trump during the debate because she has the privilege of being an experienced politician. 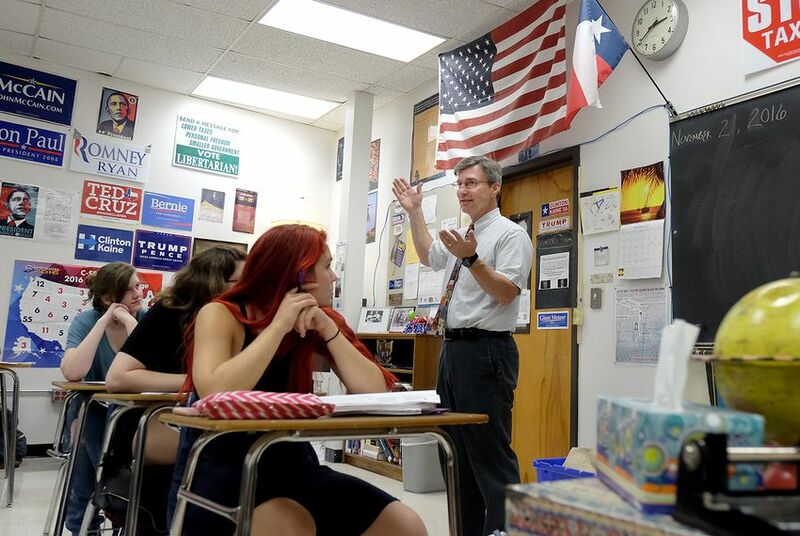 Bryan Henry, 12th-grade government teacher at Kingwood High School in Humble Independent School District, said all teachers are somewhat partisan: Even if they don't explicitly state their political preferences, they curate their lessons based on their personal priorities. "Something I find personally offensive might be something I'm more prone to end up mentioning," he said. Liberal Arts and Science Academy's Risinger is openly Republican, having served as a delegate at this year's Republican National Convention. A self-described "reserved" Trump supporter, he challenges his students, who are mostly liberal, to think as clearly about Clinton's failings as a candidate as they do Trump's failings. A major lesson is that politicians on both sides can be "hypocrites." Twelfth grader Ellanora Childs said Risinger talks a lot about the issues with Clinton's campaign. "He thinks we don't hear about that as much," Childs said. Most of the class period is spent debating, with him and other students, which can be exciting — but recently, has been tiring. "I'm sick of the election," she said. A since-deleted tweet sent from Texas Agriculture Commissioner Sid Miller's account on Tuesday used an obscene term to describe Hillary Clinton. Miller's staff claimed he had been hacked, then apologized for a mistaken retweet.